Whether you are a newly promoted manager, a seasoned business owner, or a human resources professional, knowing the ins and outs of dealing with HR issues is critical to your success. The Essential HR Handbook is a quick-reference guide that sheds light on the issues that keep managers up at night. It is filled with information, tools, tips, checklists, and road maps to guide managers and HR professionals through the maze of people and legal issues, from recruiting and retaining the best employees to terminating poor performers. • Individually manage each employee, starting on his or her first day. • Manage a multi-generational workforce. • Provide equitable pay, benefits, and total rewards strategies. • Identify legal pitfalls and stay out of court. 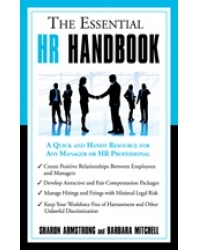 The Essential HR Handbook is the one HR guide every manager needs on his or her desk! Sharon Armstrong began her career in human resources in 1985 as a recruiter/trainer in a large Manhattan law firm. Since launching her own consulting business in 1998, she has provided training and completed HR projects for a wide variety of clients. She is the author of Stress-free Performance Appraisals. Barbara Mitchell, a human resources professional and co-owner of The Millennium Group International, LLC, is a frequent speaker on HR topics. Much of her business career was spent in leadership positions with Marriott International. Both authors live in the Washington, D.C. area.